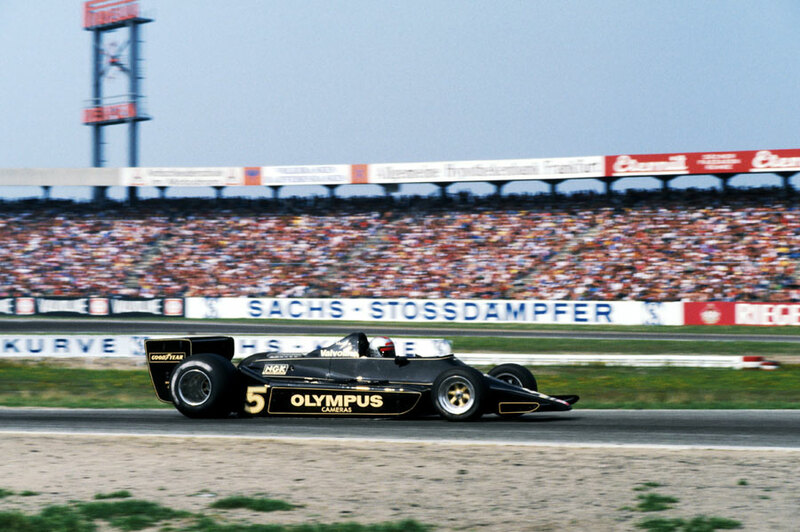 Mario Andretti won the German Grand Prix at Hockenheim - his fourth win in six races - to further extend his commanding lead in the drivers' championship. Hunt, almost inevitably, was again in trouble during practice. He came up fast behind the coasting Surtees of Vittorio Brambilla, which was low on fuel, and his qualifying lap was spoiled. Brambilla had his hand up as a warning but Hunt claimed he did not see it. Angry, Hunt decided on revenge, and later on he hit his brakes when Brambilla was on his tail and the Surtees piled into the rear of the McLaren. A livid Brambilla ran to Hunt's car when the pair returned to the pits and smashed his fist down on his still helmeted head. The conditions were gruelling, with scorching temperatures causing several retirements. Ronnie Peterson led throughout the opening laps, but after six laps of the track with its long, fast curves punctuated by tricky chicanes, Andretti forged ahead with his team-mate right on his tail. Behind them the field fell apart. Within four laps Carlos Reutemann was in the pits looking for new tyres, and Nikki Lauda was walking home from a blown up Brabham Alfa Romeo. Peterson's car, however, started to sound poorly in the final stages, and it transpired he had lost fourth gear. Within three laps his engine all but fell apart and he abandoned his Lotus on the side of the track. Jody Scheckter, 40 seconds adrift at the time, moved into second, a remarkable achievement considering engine trouble had left him at the back of the field after the first lap. The local hero was the bearded Harald Ertl, who brought his Ensign up to sixth before he suffered a puncture four laps from the end. Hunt was another to have tyre troubles, and his day got worse when he was disqualified for taking a short cut back to the pits after sustaining a puncture. "I had another four miles all round the circuit to get back to the pits on a flat tyre which was shredded," he admitted. "I went hurtling out again just for the hell of it, just to enjoy myself. But a few laps later I was black flagged." With four races left, Andretti's lead was 18 points over Peterson, with Niki Lauda and Reutemann a further five points adrift.